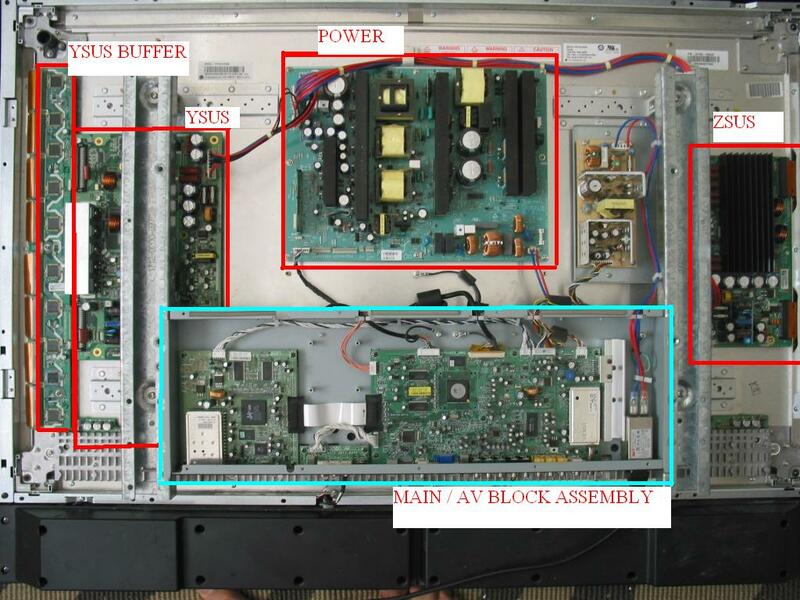 Coppell TV Repair online blog: Should I replace / repair one or both sustain boards in my plasma TV? Should I replace / repair one or both sustain boards in my plasma TV? I have a blown fuse on my YSUS board, but not on the ZSUS. Do they need to be replaced in pairs, or can we just fix the YSUS? Thanks!! We get this question all the time and we give the answers all the time, so once and for all we'll post the answer here and just point people to it. Short answer: Yes - service both. What are sustain boards and what do they do? Every plasma TV that we know has two sustain boards - Y-SUS and Z-SUS (also sometimes called X-SUS). Below is a picture of a randomly picked plasma which shows their location, which is again the same in all plasma TVs that we have seen this far. You can click on the image to see it in full size. Y-Sustain and Z-Sustain have very similar functions, but, as can be seen, the YSUS is a bit larger than the ZSUS. It also produces output that goes into what's called YSUS BUFFER board(s) which in turn output to the plasma display whereas the ZSUS outputs directly to the plasma display. It is because the YSUS does a little more work than the ZSUS. Roughly said, while the ZSUS activates all display lines at once (thus affecting the whole display at the same time) the YSUS, with the help of the buffers, is able to activate (technically address) the individual lines on the display. Other than that, though, they do pretty much the same thing. The two boards work together on the display in order to produce proper images, however they do not need each other in order to function. In other words the function of one does not affect the function of the other. They work on the display practically independently from one another, only in a fashion synchronized by another board, so that you get to see what you want to see. When one sustain board fails it does not affect functionality of the other. In other words if your YSUS failed that should not and usually do not affect your ZSUS and the other way around. The most notable exception that I can think of is when one of the boards takes power from the other and not directly from the power board. This is the case in some LG 50'' models where the ZSUS 6871QYH044 takes power through the YSUS 6871QYH039; when YSUS fails it may burn the fuse and thus cut ZSUS from power. Technically, however, ZSUS' functionality is still not affected in this case - the board is functional, only the power to it is cut. Which is to explain and underscore that functionality of one sustain is not affected by the other. It may still be better to service or replace both sustain boards at the same time. Sustain boards are the hardest working boards in plasma TVs. Many of them, especially those designed in the early plasma technology years - 2001 to 2005 - are improperly designed and/or improperly built so that they work at too high temperatures. As you should know from your basic physics course matter expands when its temperature raises and shrinks when temperature lowers. The higher the temperature differences, the bigger the physical difference. This cycle of expansion and shrinking , let's call it thermo-cycle, is also affecting other properties of the matter than its size. It also changes its electrical and mechanical properties. To summarize: because they work on too high temperatures, their expansion/shrinking is too drastic and that leads out to too limited life expressed in failures every several years. Is it a design failure? Or is it simply badly built semiconductors? Was it done on purpose? Or was it just another side of the wild competition leading to lower quality? What happens with your sustain boards during their life time? Well, they wear out, that's what happens. The example I like to give is two car tires on the road. Road and friction do to car tires what marginal thermo-cycles do to semiconductors (and everything else actually). So you've had two tires that have been working side by side for so long that they both got very worn out. You didn't see the treads, but if you were to look maybe you would have seen them. And one sweet day one of your tires just couldn't take it anymore and blew. Just from wearing out. Car tires - and semiconductors - are never really exactly the same, so they'd rarely wear out in the exact same way and burst out at the exact same time. But you can make a very good guess as to the condition of your other tire or sustain when one of them bursts. You don't risk your life or someone else's life when you watch TV. Often the second sustain board would fail fairly soon after the first - hours to days. About equally often it may take weeks. It would be unusual to take months, but it is not unheard of. Of course it is best to replace it with brand new one, but this is often prohibitively expensive or even impossible. I personally wouldn't advise anyone to spend $250 for a brand new sustain board on a 42'' or even 50'' plasma TV made in 2005 or so. It's flat out insane, first because TV prices dropped a lot since then and second because we know now that soon that TV is likely to need at least another board replaced. $500 for service of a TV that can be replaced for $600? Thanks, but no thanks! Service, on the other hand, ensures (when properly done) that the power components will be replaced with new ones. Replacement with a used board obtained from a chop-shop like Discount-Merchant, ShopJimmy or eBay is going to replace one used board with another used board...with very short life expectancy. Dear Coppelltvrepair, I have a Sanyo Plasma tv DP42746 and it was working great, then one day the tv would not display any sound or picture. The tv does power up and the green light in the right lower corner lights up, but no sound or picture. I took of the back panel and noticed the error code light was green also, not blinking, the fuses showed continuity, and no capacitors appeared to be dome shaped. I did notice a white paste had melted out from under the biggest heat sink on the y-sustain board. It leaked onto the fuse ,below the heat sink and IC, and onto the power connector. I tested the y-buffers as you described and both showed 595Mohms in the reverse direction, and infinity in the right direction. There is also a buzzing sound coming from the heat sink that leaked the white paste. Should I just get the y-sustain board repaired?